Actually, any size batteries will suffice for this experiment, but it is recommended to have at least two different voltages available to make it more interesting. 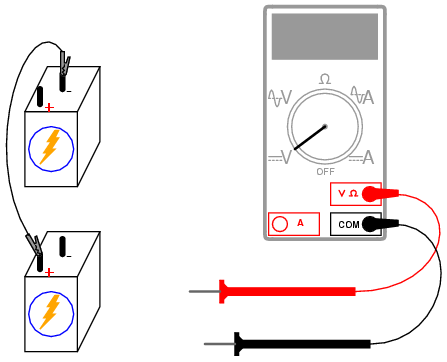 Lessons In Electric Circuits, Volume 1, chapter 5: "Series and Parallel Circuits"
Lessons In Electric Circuits, Volume 1, chapter 11: "Batteries and Power Systems"
How does the total voltage compare in this situation to the previous one with both batteries "aiding?" 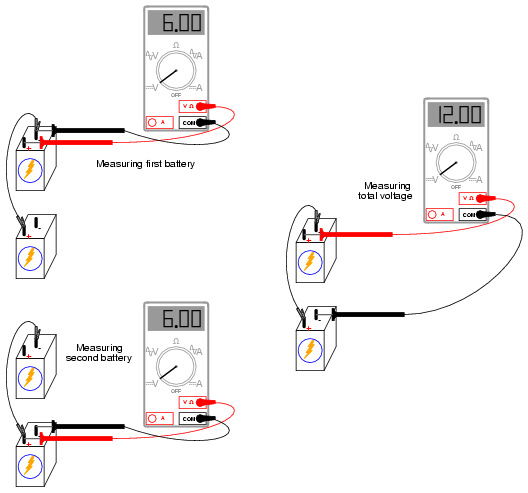 Note the polarity of the total voltage as indicated by the voltmeter indication and test probe orientation. 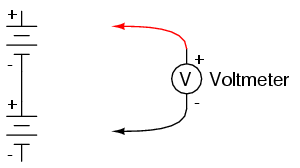 Remember, if the meter's digital indication is a positive number, the red probe is positive (+) and the black probe negative (-); if the indication is a negative number, the polarity is "backward" (red=negative, black=positive). Analog meters simply will not read properly if reverse-connected, because the needle tries to move the wrong direction (left instead of right). Can you predict what the overall voltage polarity will be, knowing the polarities of the individual batteries and their respective strengths?